The end is coming for the Transformers Chaos storyline and with it is the relaunch of the Transformers comics in a post-civil war universe. The war is over; being an Autobot or Decepticon is just a term to a returning civilian population. If you have been fighting for millions of years, the next question seems to be "what now?" for each warrior and how they will play a part in the future of Cybertron. The two news series coming in January, called Transformers: More than Meets the Eye and Transformers: Robots in Disguise will explore the future of the Transformer race. 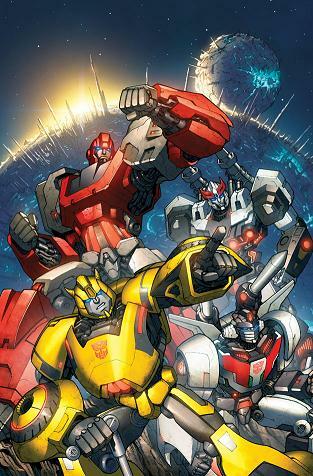 In an interview with Comic Book Resources, the writers John Barber (MTMTE) and James Roberts (RID) spoke about what each series will focus on and the dynamics that are name in play for a victorious but fractured Autobot army. Below are highlights, the full article is here. - The war may be over but "grudges die hard". Stories will explore complications when two factions must work together to rebuild Cybertron. - The return of the much larger "civilian" population that waited out the war (talk about patience) has resulted in the surviving fighters to become marginalized and now must create a new future for themselves. - Part of the purpose of the relaunch is recreate a new entry point for readers that are new or casual fans of Transformers but don't know the 25 years of history like some. - In MTMTE, Rodimus Prime's group will hunt for the Knights of Cybertron in attempt to restore the Golden Age of Cybertron. About half of the Autobot army join him including Ratchet, Ultra Magnus, Drift, Blaster, Hound, Brawn, Huffer, Gears, and other "wild cards. Focus will be on 10 core characters. - RID follows Bumblebee and the other Autobot half that stayed with him to try and rebuild Cybertron while dealing with the incoming civilian population. - The Death of Optimus Prime one-shot was called "Schism" to reflect the split between the Autobot army but then X-Men announced their event with the same title. - The schism, in effect Rodimus vs. Bumblebee, is each want to rebuild Cybertron but have different belief on how that should be done. - Bumblebee is the leader in part because given that responsibility on Earth and that carries over after event in Death of, but also because "there really isn't anybody else willing to put themselves in [that] position." - Bee's core group will be Prowl (security), Ironhide (explore post war Cybertron), Wheeljack (infrastructure), and other fan favorites. I have listened about it, sounds very interesting. I think it has some good stuffs, children will sourly like it.